For many years, I, like most of my neighbors and friends, discarded the pumpkins we used for fall decorations. 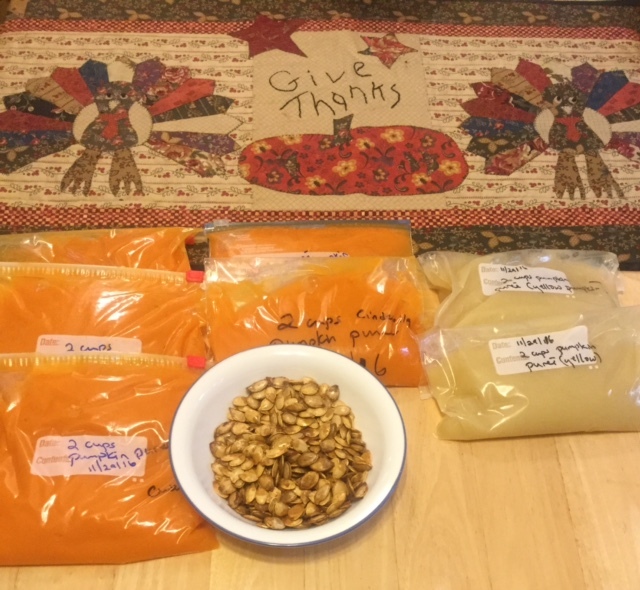 Several years ago, I found that our Jack o’ Lanterns, and other fall pumpkins, did not have to be discarded, but could be used for pies, and many other recipes. This is a rerun of an article that Laurie did in the past. I thought it was very well done and a timely article! 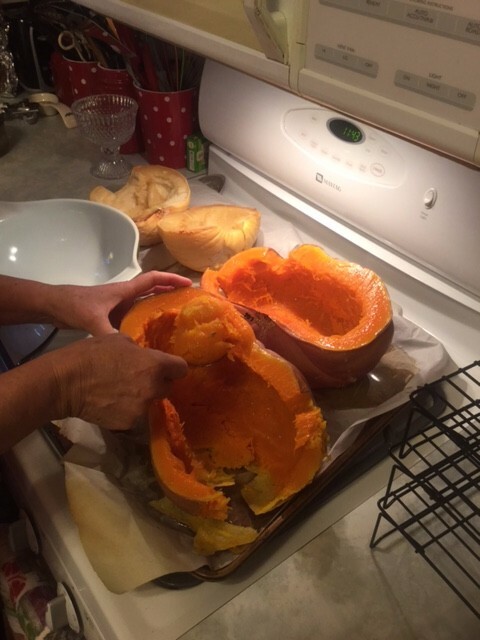 Many of the large pumpkins used for carving at Halloween are not the best to use for cooking, as they have a high water content, but many other varieties that are used for decorating can be used for cooking. One variety is the Cinderella pumpkin, so called because it resembles the pumpkin turned into a coach by Cinderella’s fairy godmother. 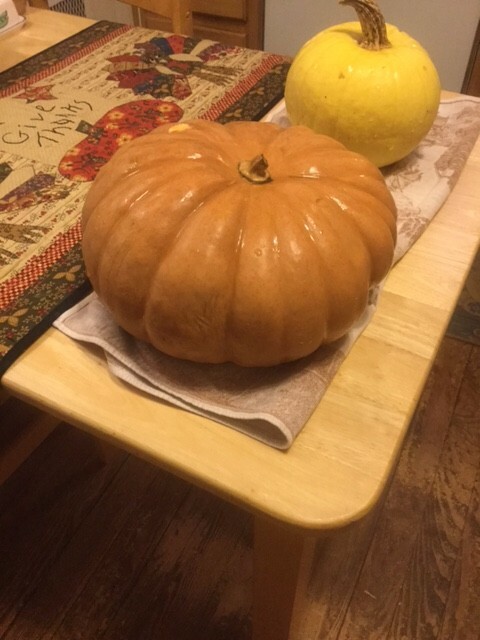 This year, I had a Cinderella pumpkin, and a small, yellow pumpkin, both of which were used on our doorstep as fall decorations. I knew from past experience that the Cinderella pumpkin is a good cooking pumpkin, but did not know anything about the yellow pumpkin. 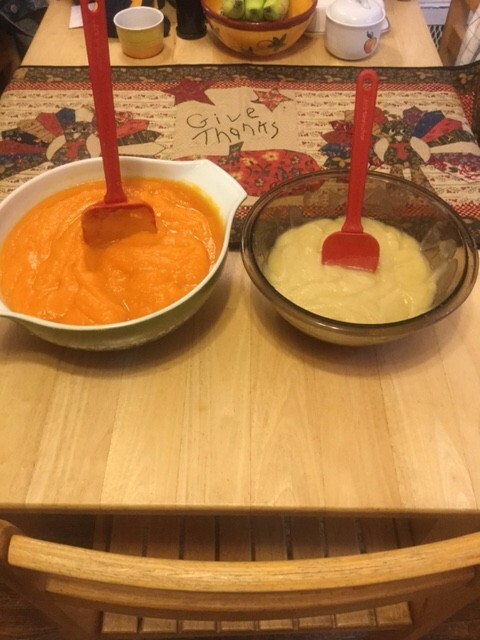 I decided to cook both pumpkins, and compare them. The pumpkin on the left is the Cinderella pumpkin. To roast the pumpkins, preheat the oven to 350 degrees. 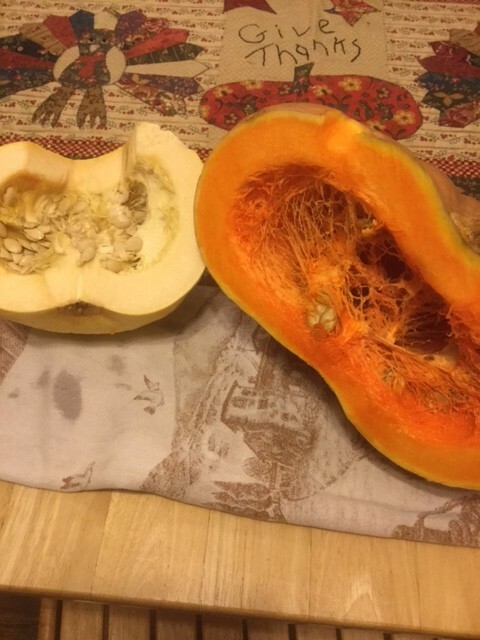 Next, cut the pumpkins in half vertically…sometimes it is easier to cut the stem out first. Scoop out the seeds, reserving for toasting later. 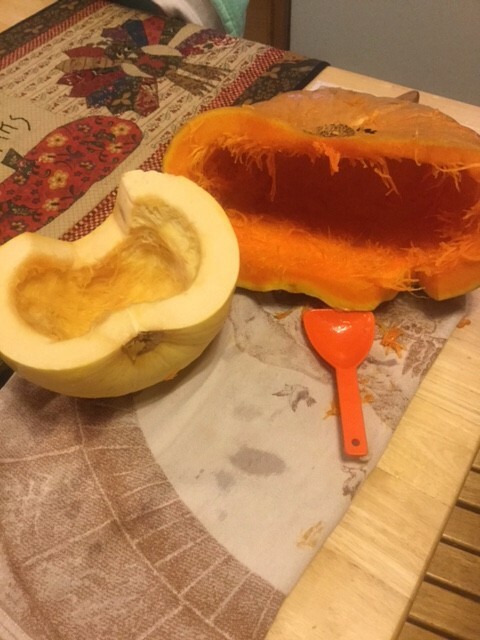 Clean out the pumpkin halves, using a sharp spoon. Now, place the pumpkins, halved sides down, on a cookie sheet lined with parchment paper. 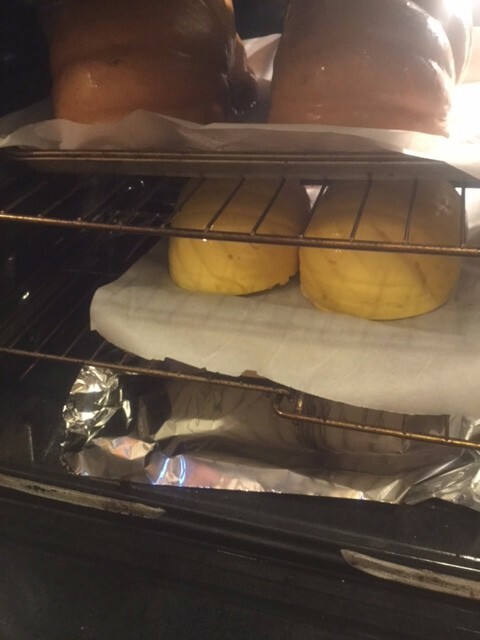 Bake in the 350 degree oven for an hour to an hour and a half, checking for “doneness” by piercing the outer edges with a knife. Remove, and allow to cool. Remove the pulp with a large spoon, and place in a bowl. 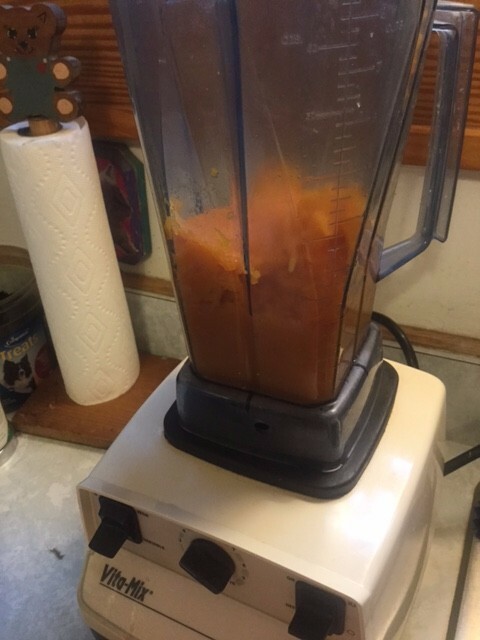 Put the cooked pumpkin, 4 cups at a time in a blender or food processor. Blend until smooth. The puréed pulp should be nice and thick. Both the pumpkins cooked down nicely. The Cinderella pumpkin had a beautiful, orange color, and somewhat sweet flavor. The yellow pumpkin’s flavor was a bit more bland, but would be perfect for any recipe calling for canned pumpkin. As an added bonus, the pumpkin seeds are tasty roasted! So, do not throw away that pumpkin…use it! We all want to eat healthfully throughout the holiday season. In-season fruits and vegetables will stay fresh longer and have the most flavor. 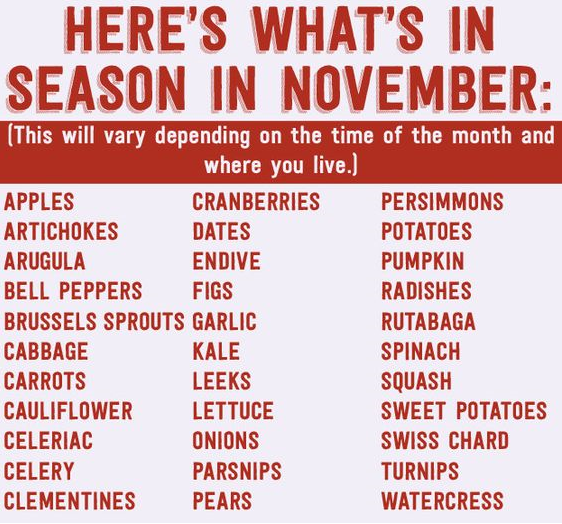 Continue reading for tips on how to purchase seasonal produce this fall! The writers at Cleveland Clinic described how seasonal eating, “… connects us to the calendar and often to one another… [seasonal food] generally has more vitamins, minerals and antioxidants than foods harvested before they’re ripe” (Cleveland Clinic Wellness). Shopping seasonally ensures you are buying food at the peak of ripeness and nutrition. Eating seasonally will save you money, too! Alan Henry, writer at LifeHacker.com, explained that because food in season is bountiful and costs less to produce, it also costs less for consumers to purchase (Henry). Now that I’ve got you intrigued with the benefits of seasonal produce, you’re probably wondering what to put on your grocery list for the rest of November. Cleveland Clinic Wellness. www.clevelandclinicwellnes.com. 2016. Web. 15 November 2016. Henry, Alan. www.lifehacker.com. April 14 2014. Web. 15 November 2016.